On my return from a trip to Arizona, I was keen to start on a new project for the Chiricahua Desert Museum. 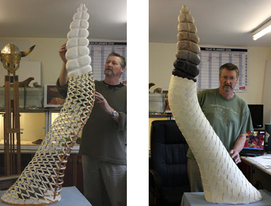 I created a large sculpture of a rattlesnake tail. After various sketches and designs were made, a working model was created in the studio. 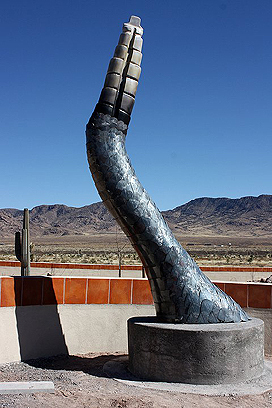 This model will be used to establish measurements and templates for the final sculpture which will be over 15ft in height, constructed of metal, and stand on public display in front of the Chiricahua Desert Museum, Rodeo, New Mexico. All winter, Charlie Painter and Mike Hill were hard at work cutting steel plate, in preparation for the construction of the rattlesnake tail sculpture. They had made an excellent job following my specifications, and in February I joined them in New Mexico, to help put the giant tail together. Later I set some rocks around the top of the concrete plinth to give it a more natural look. 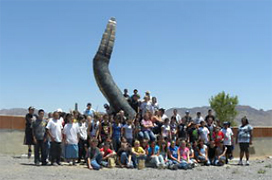 The sculpture stands approx 18ft high and is proving to be a very popular backdrop in the group photographs of the many visitors to the Chiricahua Desert Museum.